Russo-British ties date back centuries – and these Moscow landmarks can prove it. Despite the distance between Russia and the UK, the countries are connected by commercial and cultural ties that stretch back centuries. Evidence of this relationship can be found throughout the Russian capital. Here are 12 places in Moscow that demonstrate the influence of the UK in Russia’s history. The founder of Moscow, Prince Yury Dolgoruky, who belonged to the first Russian ruling dynasty, the Rurikids, might have been half English. His father was the Grand Prince of Kiev, Vladimir Monomakh, and at least one version of his personal history says that his mother was Gytha of Wessex, the daughter of Harold Godwinson (or Harold II), the last Anglo-Saxon king of England, who was killed by the Normans in the Battle of Hastings in 1066. After her father’s death, Gytha fled the country and sought protection from her uncle, the king of Denmark. He soon married her off to “Voldemar” in the far-away Kievan Rus. After living some years in Kievan Rus, Gytha reportedly left the country, took part in the First Crusade and was buried in Palestine. In 1553, during the reign of Ivan the Terrible, a trade mission from England headed by Richard Chancellor arrived in Moscow. While Spain and Portugal actively traded with India and the New World, England was in dire need of new markets. Ivan the Terrible welcomed the delegation in the royal chambers at the Kremlin and gave the English merchants unprecedented trading privileges: they were allowed to trade freely in all Russian cities without paying any customs duties. The English merchants specialized mostly in the wholesale trade of furs, timber, leather and other goods that Europe demanded and Russia could supply. To house the Muscovy Company established in London, the tsar issued a special decree granting the company spacious chambers on Varvarka Street. In 1994, the Museum of the Old English Court was opened in the chambers. Queen of England Elizabeth II and her husband, Prince Philip, took part in the museum’s opening ceremony. When the Time of Troubles came to an end and the new Romanov dynasty came to power in the early 17th century, the decision was made to rebuild the Kremlin. It was at this time that the Kremlin towers got their tent-like roofs; before then, they featured ordinary flat roofs. The first tower to be rebuilt was the Spasskaya (Savior’s) Tower in Red Square and in this reconstruction, the tower was honored with Moscow’s first chiming clock. Russian architect Bazhen Ogurtsov and Scottish clockmaker Christopher Galloway designed and installed the timepiece. Galloway constructed the clock so that the entire clock face rotated instead of just the hands, explaining that the Russians do everything in a unique way, so their clock should also be unique. Later, Galloway constructed a hydraulic mechanism in the Water Tower of the Kremlin that supplied water from the Moskva River to the tsar’s chambers. One of the most prominent figures in Russo-British history was Jacob Bruce, a close friend and supporter of Peter the Great, who came from the distinguished family that gave Scotland two of its kings. Bruce was knowledgeable in military strategy as well as science. He had an impressive library and some Muscovites speculated that he practiced black magic. Bruce was head of the observatory at the Moscow School of Mathematics and Navigation, located in the Sukharev Tower in Bolshaya Sukharevskaya Square. Legend has it that Jacob Bruce hid his book of powerful black magic in the tower’s walls. It was rumored that in the early 1930s, Stalin personally supervised the tower’s demolition. Although the Sukharev Tower did not survive, it is possible to see Jacob Bruce’s former estate in the Moscow suburb of Monino. It is currently a health resort that features unique mineral springs. In 1776, Russian Empress Catherine the Great gave permission to establish theaters in Moscow, and by 1780, Englishman Michael Maddocks had erected the Petrovsky Theater, which could seat 800 people. Attached to the theater’s main building was a rotunda where balls and masquerades were held. After the War of 1812, a new theatre was built to replace the much-loved Petrovsky Theatre – the Bolshoi Theater, now famous all over the world. Michael Maddocks was famous not only as a theatre entrepreneur, but also as an organiser of large-scale open-air parties. Maddocks purchased a land plot in the Taganka district and created a “voksal,” a garden that took both its appearance and name from London’s Vauxhall Garden. The “voksal” became so popular with Muscovites that until the middle of the 19th century, the word “voksal” was used as the name for all such public gardens. In the second half of the 19th century, due to a curious turn of events, this word came to be used to refer to a railroad’s permanent structure – “vokzal” (train station). Russian specialists went to England to learn about railroad construction experience, and while visiting the Vauxhall station, they mistakenly assumed the name of the station to be the word for a train station building. 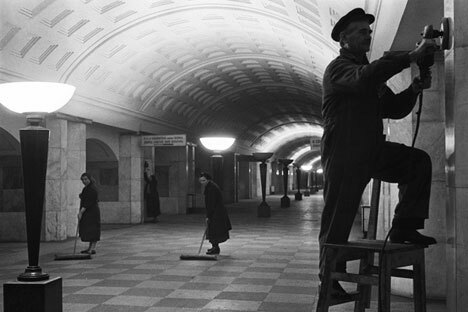 Construction of Moscow’s public underground transport, later known as the “metropolitan” began in the early 1930s. The word “metropolitan” came from London, where the first lines of the underground were built by Metropolitan Railway Company. The word “metropolitan” did not catch on in the UK, but in Soviet Russia, the company’s name became synonymous with this type of public transportation. The Central Universal Department Store (TsUM) is undoubtedly a purely Soviet name, but before the revolution of 1917, the trading house belonged to Scotsmen Andrew Muir and Archibald Merrilees.The imposing European Gothic style building was constructed in 1908. The store, which sold everything from clothes to food and the latest gadgets, was the most fashionable and expensive store in old Moscow. For wealthy customers living outside of Moscow, Muir and Merrilees even published a catalogue and sold merchandise via mail-order. One of the most luxurious and expensive hotels in Moscow, this masterpiece of a building was constructed by Russian architect Lev Kekushev and Scottish architect William Walcot. Walcot also designed mansions for a few wealthy clients in Moscow. In 1908, Walcot left for London, where he was not in much demand as an architect; he built and lived in a modest house on St. James Street, doing some painting for a living. But in 1943, at the age of 69, after he had lost all his clients, he committed suicide. Houses No.5 and No.7 on Kolpachny Pereulok, built at the very beginning of the 20th century, belonged to one of the wealthiest families in prerevolutionary Russia – the Knop family. Although the Knops came from Germany, they grew rich through their trade with England. The late 19th century was the era of the industrial revolution in Russia, when new plants were built and existing ones were modernized. At that time, the Knop’s business acumen, who supplied great quantities of English-made equipment and machinery to Russia, came in handy. There was even a saying among the common folk: “One priest for every church, one Knop for every plant.” After the Bolshevik Revolution, the Knops were forced to flee Russia and their mansion was nationalized. In the 1990s, the mansion was purchased by Mikhail Khodorkovsky’s Menatep Bank and the reconstructed mansion served as a reception house for the Yukos Oil Company before again being expropriated by the state. In Voznesensky Pereulok , there stands St. Andrew’s Anglican church, built in the 1880s by the English architect Neil Freeman. By that time, the British community in Moscow had become large and prosperous; it applied for and was granted permission to build its own church and rectory in the Victorian Gothic style. The church was consecrated in 1885 in honor of St Andrew, the patron saint of Scotland, because the Moscow-based Scots represented the most powerful faction of the British community. During the Soviet era, the church was closed. It first served as a dormitory, and until the late 1990s, it belonged to a recording studio that took full advantage of the building’s exceptional acoustics. In the early 21st century, the church was returned to the British community. Before the revolution, the building that now houses the Hotel Marco Polo at 9 Spiridonievsky Pereulok was a monastery kept by Jane McGill, the widow of a British merchant. After her husband died, she stayed in Moscow and lived on her late husband’s money. She was actively involved in charity work and provided financial support to the Anglican Church – the rectory was built entirely with her money and dedicated to her husband, Robert McGill. The year of the revolution, 1917, became a tragic one for Jane McGill, when rebel sailors stormed into her monastery and threw her out onto the street. Acquaintances found her lying in the street and brought her to the Anglican Church, but she caught a severe cold and died.